Google AdWords is Google’s technology to advertise with the use of business related keywords. It allows you to place an advertisement of your website on the search engines. They appear next to any search results on Google. These can be in the text, image and also, video format appearing on Gmail and other networks over 2 million websites and also, apps. What are the objectives of our Google AdWords Online Course? Our Google AdWords Training Course curriculum has been professionally built by our trainers. 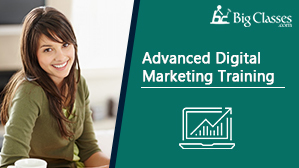 Our Digital Marketing Trainer AdWord Trainer will cover all the important concepts and subjects of Google AdWords in depth with current trends in the industry. The Google AdWord Online Training by Digital BigClasses will develop student’s Google AdWords skills and will make them easily pass the certifications. The Google AdWord Training consists of various concepts of campaigns, ad creation with implementing keywords, PPC, CPC, CTR, CTA terminologies, bidding and budget and more. You will also be taught on designing creative and engaging posts on different platforms. Google AdWords will be taught only in 30 hours, respectively. What are the skills that you will be learning with our Google AdWords Training? Who should go for this Advanced Social Media Marketing Training Course? How will Advanced Social Media Marketing Training help your career? Google AdWords is one of the crucial parts of the Digital Marketing that helps in effective targeting with the creation of campaigns. Google makes a profit from the money paid by the advertisers. The campaigns are created with the list of important keywords. These campaigns can be monitored easily by a number of clicks, impression, CTR, CPC and CPA (Click through Rare, Cost per Click, and Cost Per Acquisition). You can also measure your Return on Investment (ROI). Now, let us see why one should learn Google AdWords. According to a resource, the total Digital Advertisement will grow up to 32% by 2020. Total money spent on Advertisements will increase to 724.06 $ Billion in 2020. The top countries interested in Ad marketing are USA, Singapore, Japan, Germany and more. There are 6 Google AdWords certifications such as AdWords Fundamentals, Search Advertising, Display Advertising, Mobile Advertising, Video Advertising, and Shopping Advertising. Singapore Companies such as TMP Worldwide, MediaOne Business Group Pte Ltd, Edallianz Pte Ltd and more are hiring PPC Manager/Specialists or Digital Marketing Executive with Google AdWords knowledge. The Average Salary of a Digital Marketing Senior Executive with PPC knowledge can earn up to 3.8 $. What are the pre-requisites for Digital BigClasses’s Advanced Social Media Marketing Training Course? Digital BigClasses will provide its students training for online Google AdWords examinations. The trainer prepares the students with ongoing trends for passing the examinations. He will teach you about the 6 Google AdWords examination and will give you a precise insight into them. The Google AdWords Training is being provided by Mr. Suresh with 9 years of experience in the Digital Marketing field. The curriculum prepared is up to date, and is constantly revised with the industry standards year over year. The online training will teach you the important concepts and subjects of Digital Marketing based on real-time case studies. Projects and assignment will be given for in-depth understanding of a subject. Course materials and E-Books will be provided and is accessible for 365 days only. Workshops will be conducted for quick learning for Entrepreneurs, Business Men/Women, and Company Employees. Google AdWords training was the best. Sir taught us about the keywords, how to use them in the ad campaigns, like in the title, and description. How to understand the budding, everything. The trainer was good and the training was good. At first, I didn’t if this was the right place to learn Google AdWords. Google AdWords has a high demand, and I was confused which training organization to pick. I selected Digital BigClasses as a close friend told me. I must say, this was the best decision so far. The training has taught me a lot of the Google search engines, and how the advertisements actually work. It is a great field of digital marketing. The training gave up step by step inside on the Google AdWords. After the explanation, we had assignments, and it was all of the real time. The training course was very well organized and the course materials were very simple and easy to understand. Sir gave us good explanation on each and every subject. He gave us a good explanation and most of his explanation has questions and answers for the certificates. Thank you Bigclasses.